A new top of the range Taj property with accommodation in attractive hillside cottages with thatched roofs. 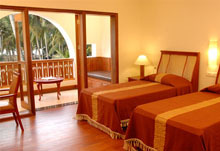 The rooms are extremely comfortable and tastefully furnished. Some have a garden view, others (including the suites) have a view of the sea. The beach is a short distance away beyond a lake where the hotel is planning to have floating cottages. Facilities include restaurants, bar, lounge, swimming pool (plus Jacuzzis) and the Jiva Spa, offering single and double treatment suites as well as a gym and beauty salon. 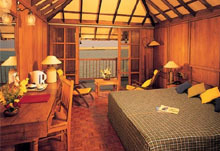 ROOM TYPES : GARDEN VIEW, SUPRIOR SEA VIEW AND SUITES. UDS located at the famed beaches of Kovalam, just 15 meters from the sea, is an exclusive 4 Star leisure beach hotel - a destination by itself. The setting, facilities, people, spa, cuisine and its whole philosophy - is dedicated to your personal wellness in a luxurious environment. Just by being at UDS, your stresses start to flutter away; the landscaping has its own serenity, a harmony of a defined architecture, spacious lawns, blue water pools and soaring coconut grooves all set in four tranquil acres by the sea. 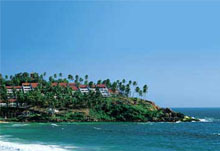 This hotel has a wonderful position on a rocky outcrop between the two main beaches of Kovalam. Despite being a large hotel it is low rise and set within huge grounds. 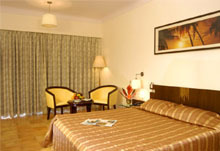 The refurbished rooms are extremely attractive and comfortable. It has a good range of facilities including restaurants, swimming pools, Ayurvedic centre, health club and its own private beach. AC & Non AC regular double rooms, deluxe rooms, suite rooms, row houses and villa with international direct dialing facilities. 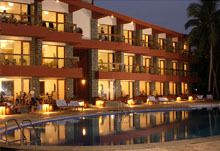 Hotel Palmshore overlooks a serene and peaceful area of the palm-fringed Kovalam Beach. 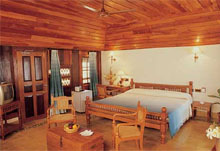 Palmshore provides many facilities such as Currency Exchange, Ayurvedic health centre, Ayurvedic oil massage etc.The fully furnished rooms and cottages with en-suite facility, having private sundeck over looks the sea.The fully furnished, air-conditioned large deluxe double rooms and cottages with en-suite facilities have private sun deck, TV and telephone. All rooms and restaurant face an exclusive beach with breathtaking view of the swimming pool and the sea. The resort is virtually encircled by water. Here nature offers you her bountiful best - a riverbank, a beach, lakes, ponds and backwaters. Look out from the resort , and you see the river beyond which is the delightful private beach and yonder, the sea. Isola Di Cocco is a heritage resort like no other. 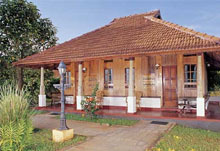 Here you have the river, the lakes, the backwaters, countryboat rides and what's more, Ayurveda. If you dream of relaxing in a heritage room or lying on the beach, lulled by the sound of waves and the rustling of palm fronds stirred by tropical trade winds, then Isola Di Cocco is just right for you. 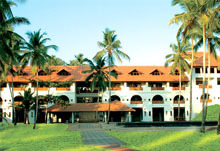 Located 30 Kms south of Trivandrum on the backwaters with a beautiful view of Arabian Sea. 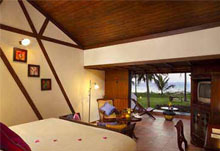 The place is ideal for honeymooners, beach holidaying, ayurveda treatments. This Resort is accessible only by boat. 15 minutes boat cruise from Poovar jetty. 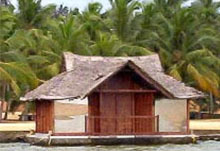 There are land cottages and floating cottages available for stay. The floating restaurant serving sea foods is very famous.